Borneo Amateur Radio Club (BARC) is one of the largest Amateur Radio Society in the North Borneo (Sabah). Its members are populated in every district. It was formed in 1993 by 9M6LS, 9M6JC, the late 9M6BZ with a few others. We have more than 200 active members and it is still growing. The Amateur Radio Club, as a non-profit organization, advances all aspects of the art of wireless communications and knowledge to serve the public interest of the community of Sabah, surrounding communities and Malaysia. BARC club house located at Sembulan, Kota Kinabalu which allowed club members to use our facilities anytime for learning, CQ activities & etc. Our club house also use for Sabah Amateur Radio Emergency Communication & Operation Centre (Pusat Komunikasi Dan Operasi Kecemasan Radio Amatur Negeri Sabah) which has been officially recognized by MCMC and Sabah State Government on 2016. 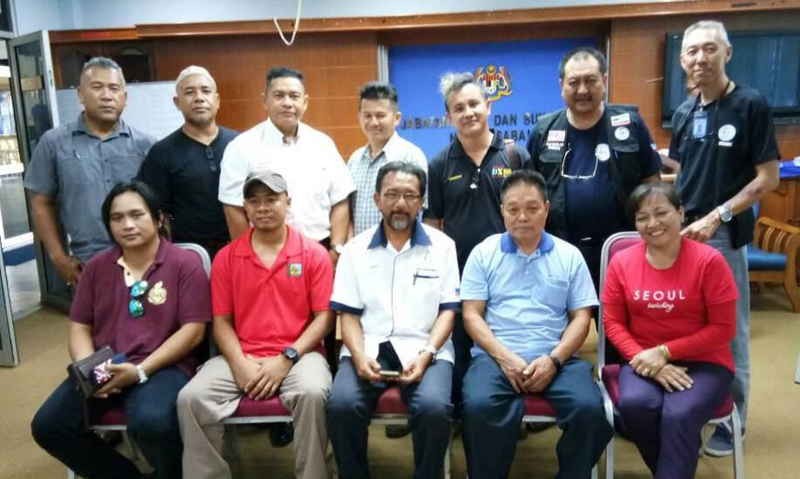 Standing (left to right): Amer Phadillah 9M6MER (CM), Darrusman Mohd Noeri 9M6DRS (CM), Gilbert Andrew Salabin 9M6GAS (CM), Lee Chews Ensim SWL (CM), Timothy Yamping 9W6TTY (CM), Roslan Nunsi 9W6RHN (CM), Amin Chung 9W6AMC (CM). Seated (left to right): Johari Jasni 9W6MJJ (Treasurer), Azarie Amat 9W6CHO (Vice President), Adzhar Tan Sri R. M. Jasni 9W6EDJ (President), Timothy Kurin 9M6TK (Secretary), Mary Jusi 9M6MYJ (Asst Secretary).